Vibration Isolation and the Yerzley Oscillograph - Tavdi Company, Inc.
Impact energy absorption and hysteresis are important parameters that predict vibration isolation characteristics of rubber compounds. The rubber used in vibration isolators should have an optimum amount of fillers (carbon black) to maximize energy absorption. 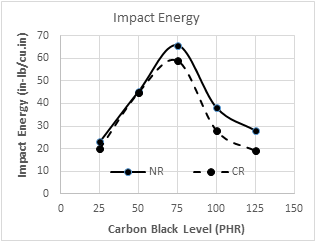 The work by Dr. Sujit K. Datta of IRM Corp. of India shows that there is an optimum level of carbon black filler beyond which energy absorption characteristics are degraded. 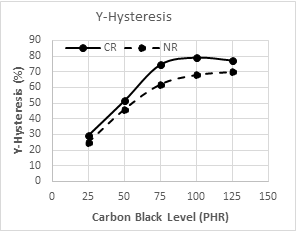 As illustrated below, at 75 Parts per Hundred parts of Rubber (PHR) energy absorption is maximized; whereas, the hysteresis plot flattens out after 75 PHR. These results were obtained by using an Advanced Yerzley Oscillograph.